It recently occurred to me that I would be able to wear a great deal more of my handmade items if I just had a few more neutrals garments on hand. It also occurred to me that I have a tendency not to sew neutrals. Notice a problem? Neutrals are the oft-forgotten heroes of fashion – they allow you to wear that flamboyant top, because the pants balance it out, etc. Yet every time I walk into the fabric store, I’m enticed by the bright colors and fun prints all around me, and I forget that simpler, quieter makes can be just as fulfilling. In fact, sewing with neutrals is an excellent reminder of the power of fabric itself – unadorned by flashy designs, neutrals showcase the fibers themselves, which have their own distinct beauty. Ok, sorry if I got too poetic up there, but I’m just so excited about all of the gorgeous chambrays that recently came to Grey’s Fabrics. I happened to be in the shop when a new shipment came in from Robert Kaufman, and I was smitten. 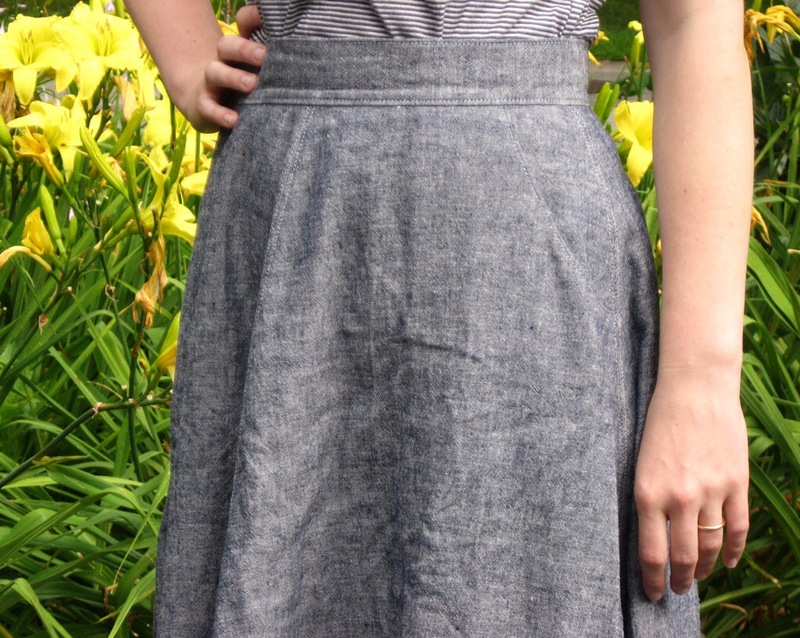 After a lovely evening with the Crafty Foxes Sewing Club, it finally dawned on me that I should make another Hollyburn Skirt out of one of the denim-colored chambrays – hello, captain obvious! I had been dying to make a second Hollyburn ever since my first, and this was pretty much a match made in heaven. I decided to include some decorative topstitching around the seams, since it’s such a simple pattern and I wanted a little more detail. I used a slightly longer stitch length than usual, 3 mm, a suggestion I had read on Lauren’s blog, and I really like the result. 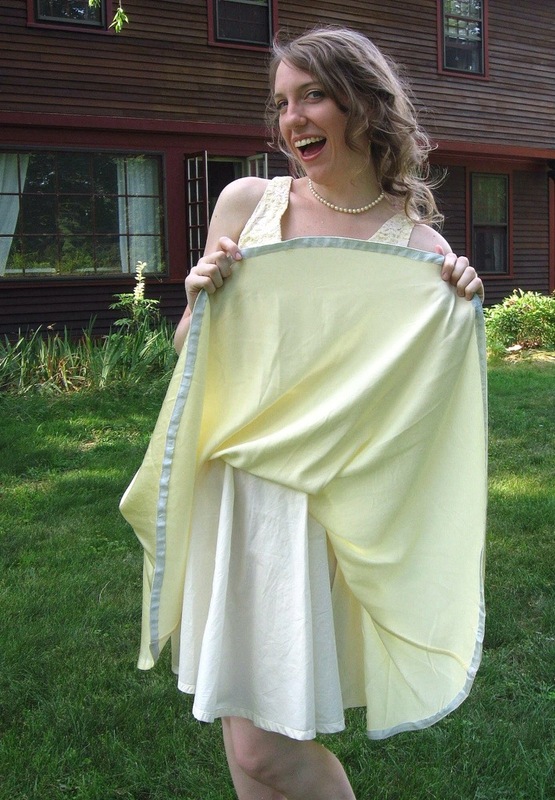 The fabric is a blend of cotton and linen – 55% cotton/45% linen, I believe – which made it wonderful to sew and wear. 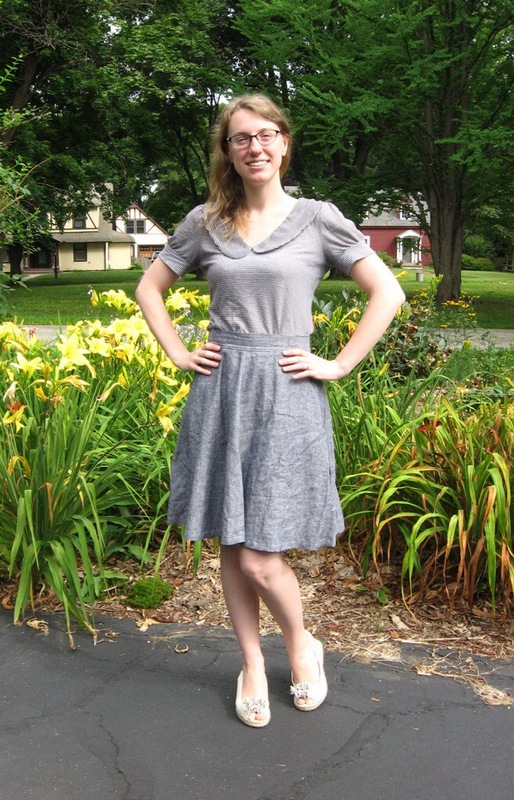 *Edit: it’s actually a linen/rayon blend – no wonder it’s to amazing! * It was very stable to work with, thanks to the cotton, but still drapes very nicely, thanks to the linen. Also, I doesn’t wrinkle as badly as pure linen – a major plus! 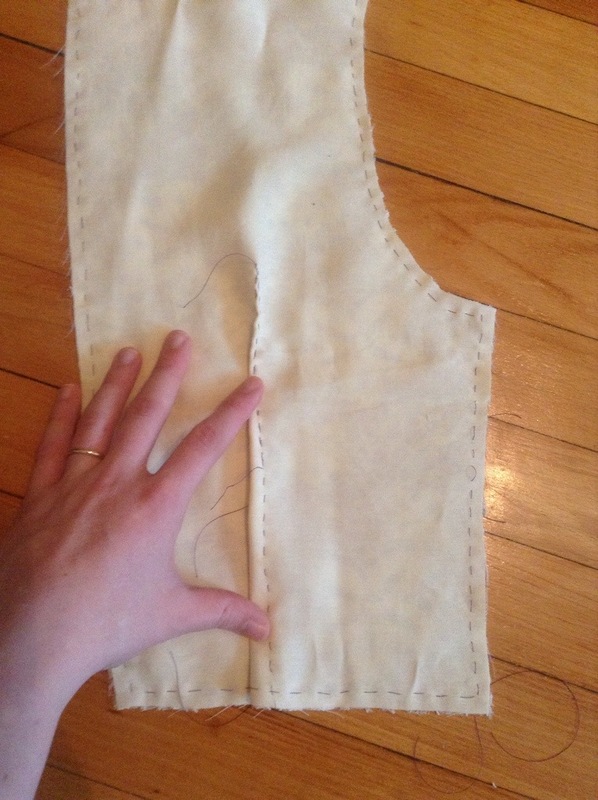 Oh, and I decided to try something new with this make – I sewed a regular zipper! I figured that would work better with the topstitching than an invisible zipper (and I really don’t remember how to do a lapped zipper!). I still prefer invisible zippers, but it was good to try something “new” for a change. So there you have it! A simple, neutral skirt that I can pair with just about anything! I’ve always hated shorts. I managed to avoid wearing them most of my life (granted, my penchant for skirts has helped with that), and only grudgingly purchased a pair a year or so ago because they were Princeton orange and it was reunions season :P. For a while this was because I hated my legs, but a few years ago when I was dancing fairly regularly I decided they weren’t so bad – but I still disliked shorts. That is, until Katy and Laney did the impossible: they created a shorts pattern that I don’t just like, I love! 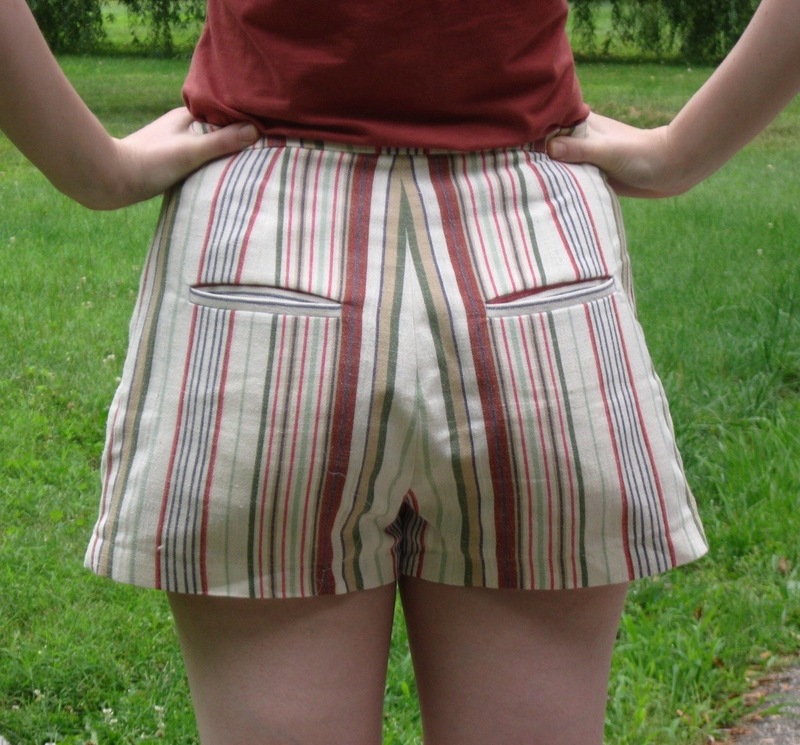 Their very first pattern, the Tap Shorts, is a real knock-out, and one I plan to make again and again (and again!). I was first drawn to the pattern because, even though it’s a shorts pattern, it still fits many of my favorite design features – a high waist and a silhouette that brings the eye away from the waist and down to the hips. As I’ve mentioned before, I have a pretty square figure, so I actually like drawing some attention to my hips (and shoulders, too), since it creates the illusion of an hourglass figure. These shorts are perfect for that! 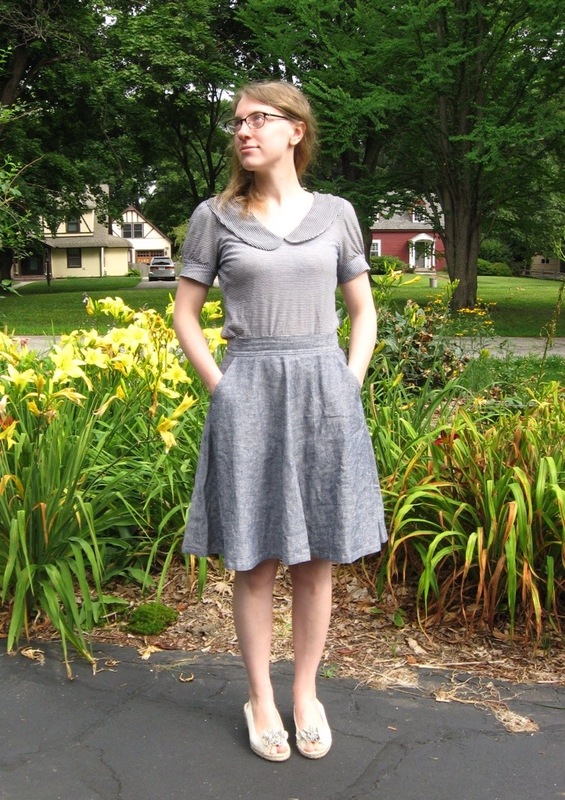 For my first pair, I chose the somewhat controversial view B, with the wide pleats running from the waist to the hem. Some folks have been bothered by the attention it brings to the hips, but as I mentioned above, I’m fine with that. In fact, I think that extra fullness helps mask my tummy, and I’ll take all the help I can get there! The fabric I chose was another gift from my Princeton fairy godmother. I think it’s a linen/poly blend, because it didn’t shrink at all when I tested a swatch. It’s a nice, hefty home dec weight, which was perfect for this project. Voilà! I don’t know about you, but I’m pretty thrilled with them! I had a ball constructing them as well. The instructions were impeccably written – honestly, these were the best instructions I’ve ever seen, hands down. I had originally planned to wait for the sewalong to attempt the welt pockets (I’ve never sewn welt pockets before, so I was nervous! ), but I got impatient and decided to chance it on my own. And I got it right on the very first try! The instructions were very clear, and the illustrations took a lot of the mystery out of the process. These ladies are clearly talented teachers as well as designers. Here’s a pic without a cutesy pose so you can see the fit – the wrinkles are mostly (if not completely) due to the fabric, not the fit. However, you can see the waistband dip down a bit. 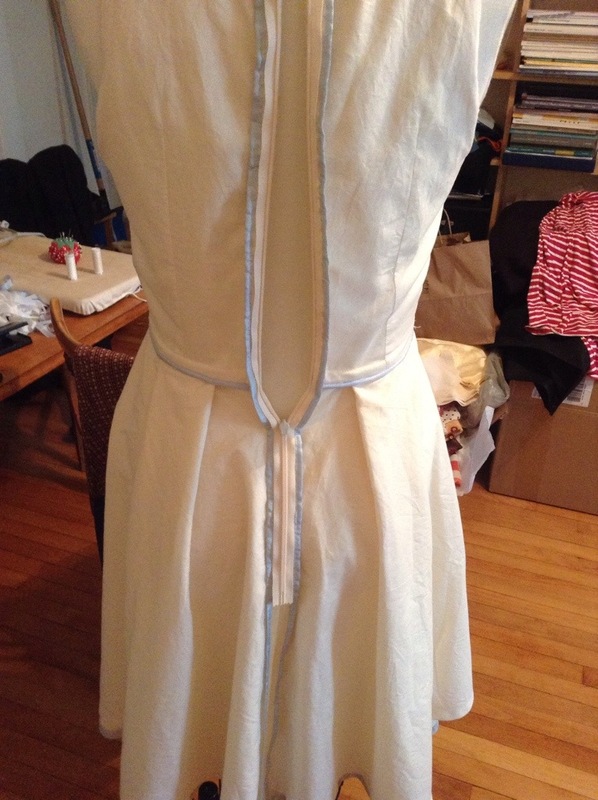 Also, when the pleats were still basted in place, I noticed that the fit was quite snug, so I will definitely need to make some alterations if I ever plan to make the other views (view A fits like view B with the pleats sewn down – I asked 🙂 ). So what do y’all think? Any fitting suggestions? I have literally no pants fitting experience at all, so I’ll take all the help I can get! My goal is to muslin the Colette Clovers (which I will do with fear and trembling…) after I’m comfortable with the Tap Shorts inseam. 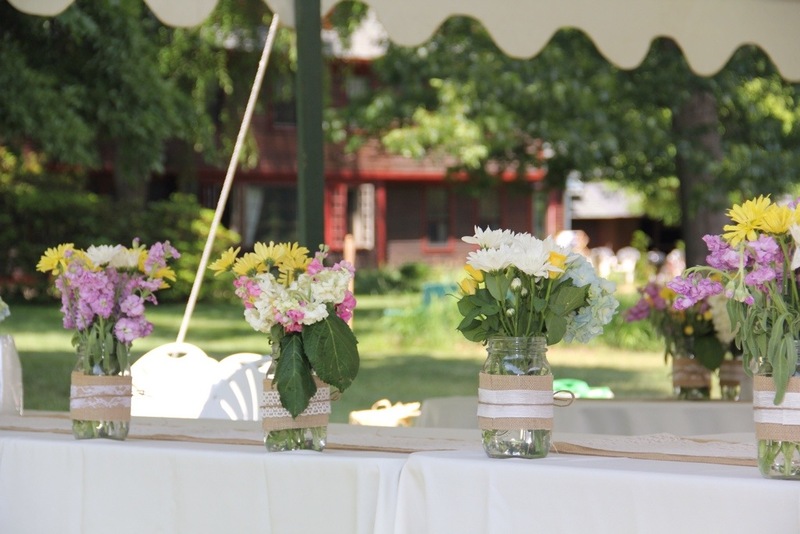 How to Host a Tastefully Frugal Reception + A Tutorial! 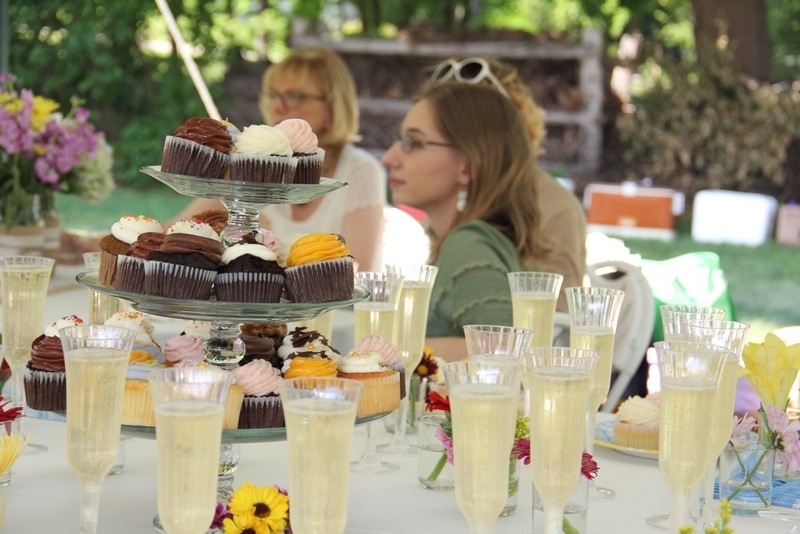 And now for the fourth and final post about my Anniversary Party! (Are y’all sick of this yet?? :P) For those of you considering planning a similar event in the future, I thought you might appreciate a few details on how I put this together and what it cost. First, a bit of background. 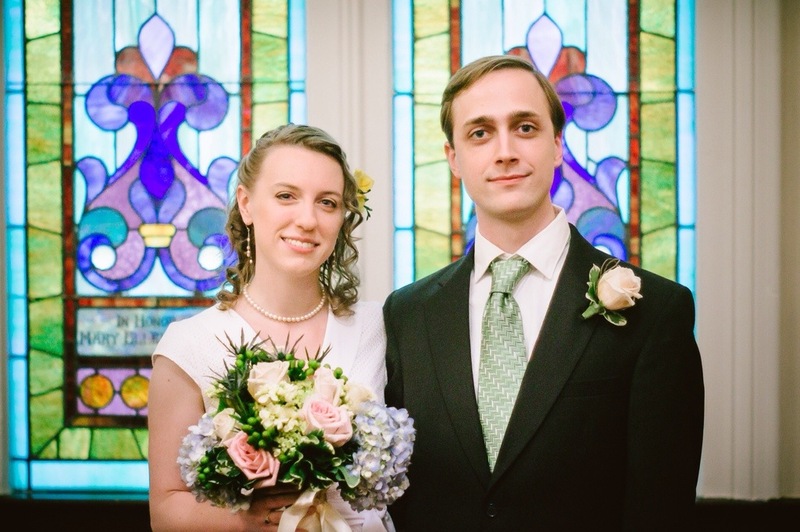 As I mentioned earlier, my husband and I got married on the fly back in 2013 – we literally planned the whole thing in about two weeks! We had a lovely, tiny ceremony in the church I worked at at the time, with a few family members and friends (twelve people total). Since I wanted to make that day as special as I could, I did splurge and spend money on a few things. After the obligatory online research I conducted, I decided that, for this event, it was best to leave any floral endeavors to the professionals. Center pieces are one thing, but a full-on bouquet and boutonniere was not something I wanted to attempt. My other two priorities were photography and cupcakes. 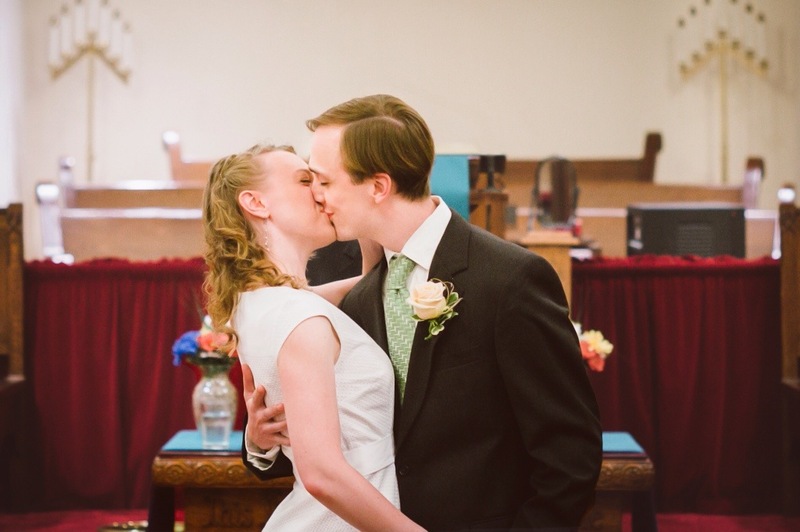 I originally wasn’t going to bother with a photographer, but a friend convinced me to at the last minute, and I’m so glad I did – I love looking back at our beautiful wedding photos! And the cupcakes were delicious. My parents also got some wraps and other food for a informal reception at my apartment afterwards, so that event totaled around $1,000. 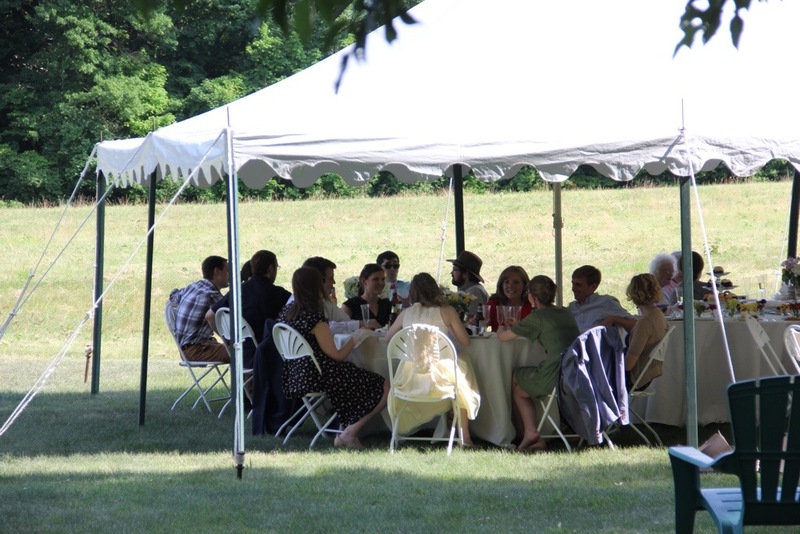 We were able to hold the party in my in-laws’ lovely, spacious backyard, which was an amazing way to save money – renting a venue can be incredibly costly! 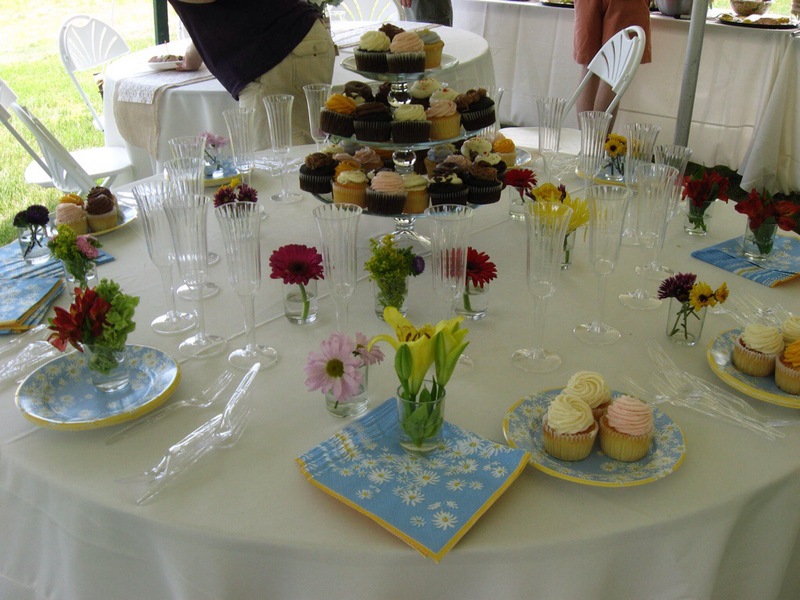 So, money saving tip #1: hold your event at home! 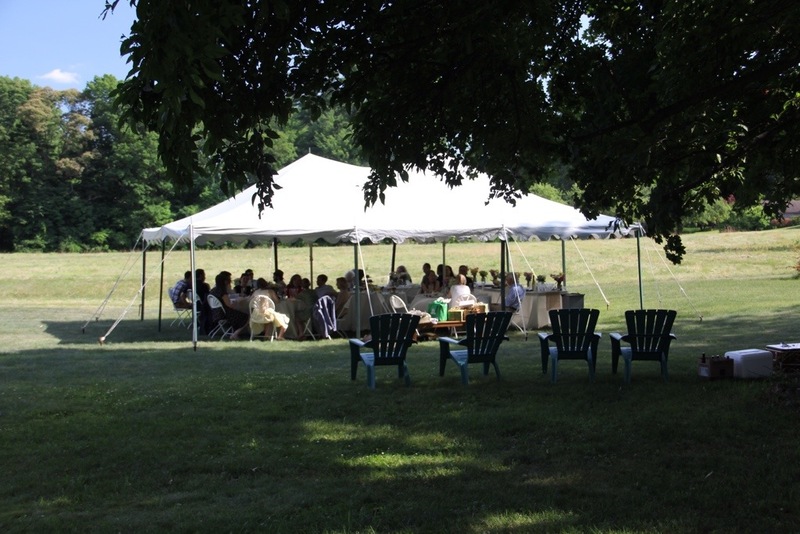 The tent rental was one of my biggest expenses, and I was reading that rentals could be in the thousands. Oy! However, I managed to get mine for around $800 – I rented the smallest tent available (20×30), and didn’t include any of the “fancy” extras like a dance floor. That price included tables, chairs, and linens, which was an awesome deal! 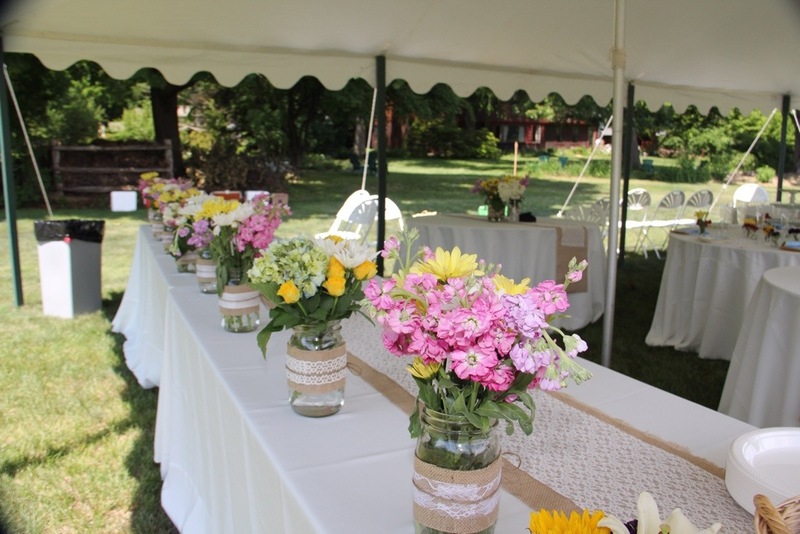 Oh, and also – money saving tip #2: – I didn’t use the word “wedding” when making my tent reservation. That one little word can change a LOT price-wise. For example, we originally were going to print invitations through a wedding-specific site, but then realized that if we printed them through a regular card printing site (we went with Shutterfly), suddenly we were paying half the price! 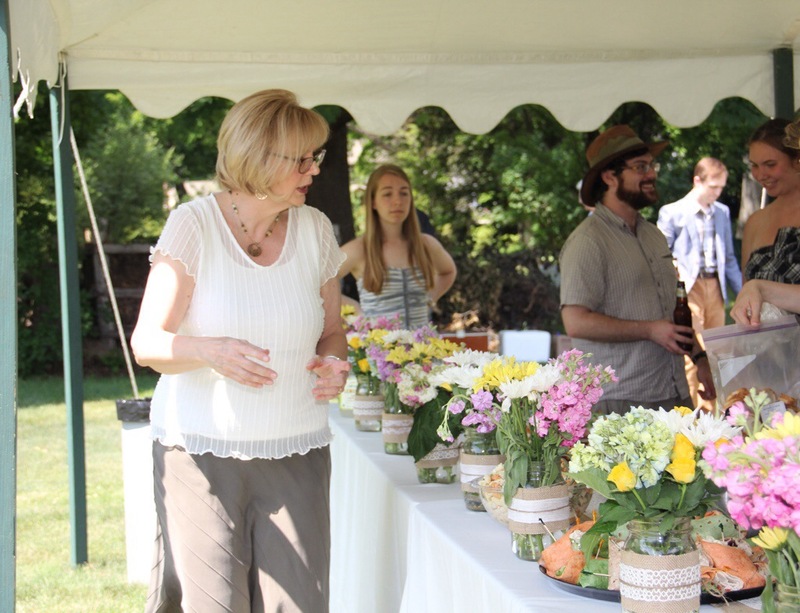 So, as exciting as a wedding is, if you can avoid the word when talking to vendors, do it. We ended up still having a pretty small crowd – just under 30 people – so I knew we could get nice food without spending too much money. I ended up getting most of my food from a local caterer that ended up being truly fantastic. 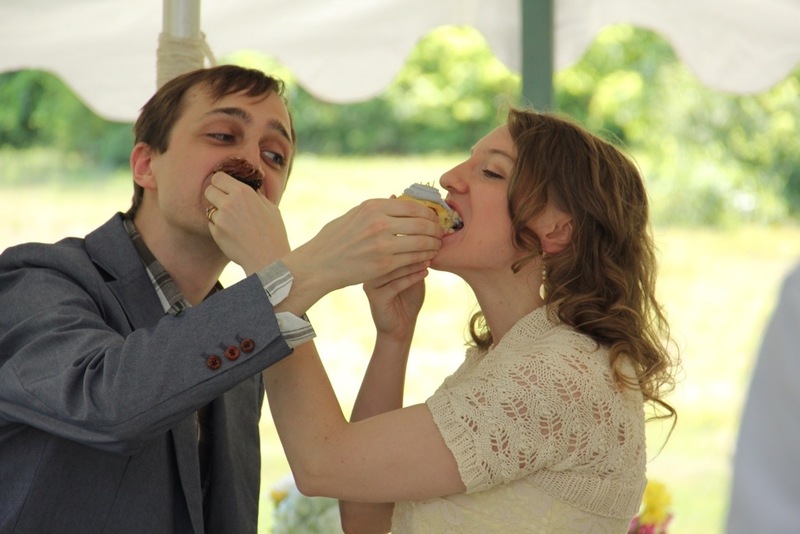 The desserts I got from my favorite local bakeries in Boston, and I even convinced a friend of mine in NJ to pick up some of the cupcakes we had at our wedding from a Princeton bakery! Even with those little luxuries, the food totaled around $800. 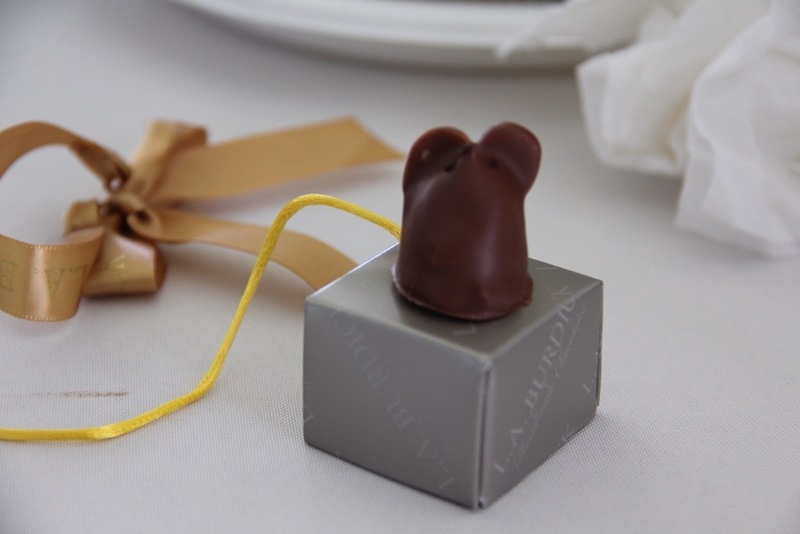 We even got fun little favors – chocolate mice truffles from my favorite chocolate shop! 1. 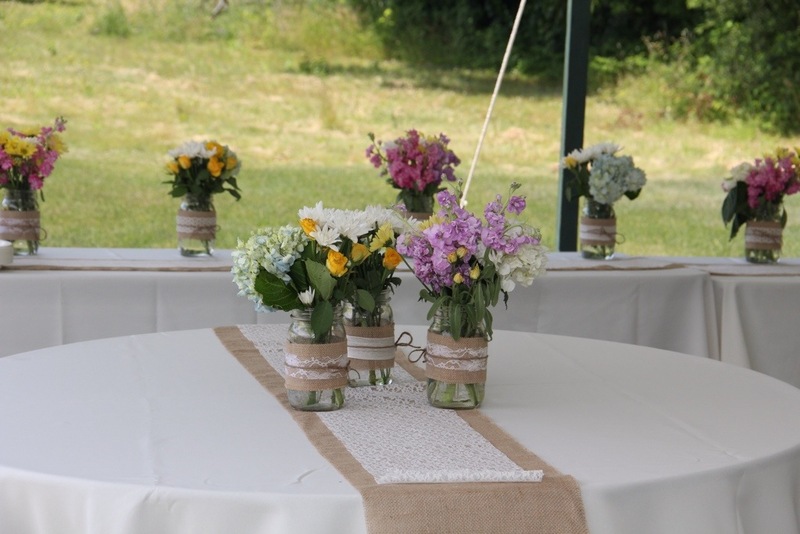 Gather your supplies – I used quart-sized mason jars, bought burlap by the yard, lace in spools, and a big spool of hemp, and used a hot glue gun for construction. 2. 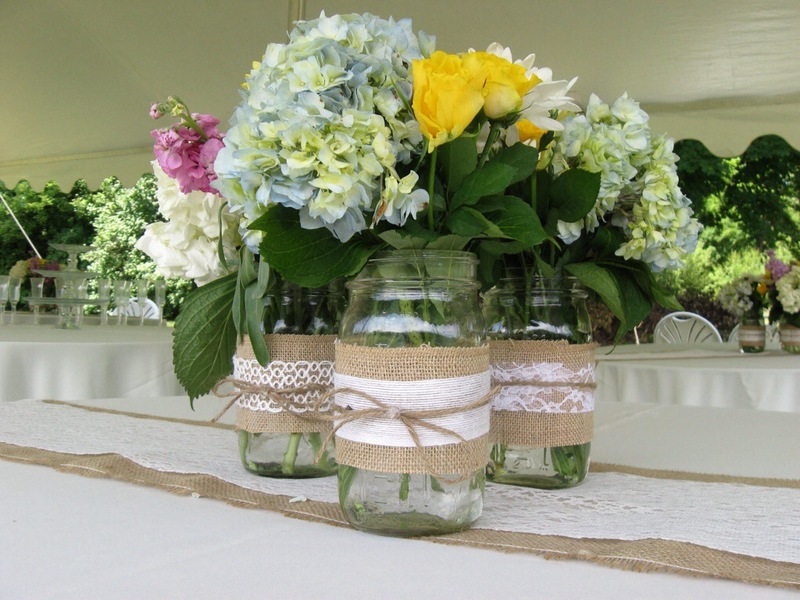 Cut the burlap to the size desired – mine were about 4″ wide by the circumference of the jar plus about 3″ to overlap. 3. 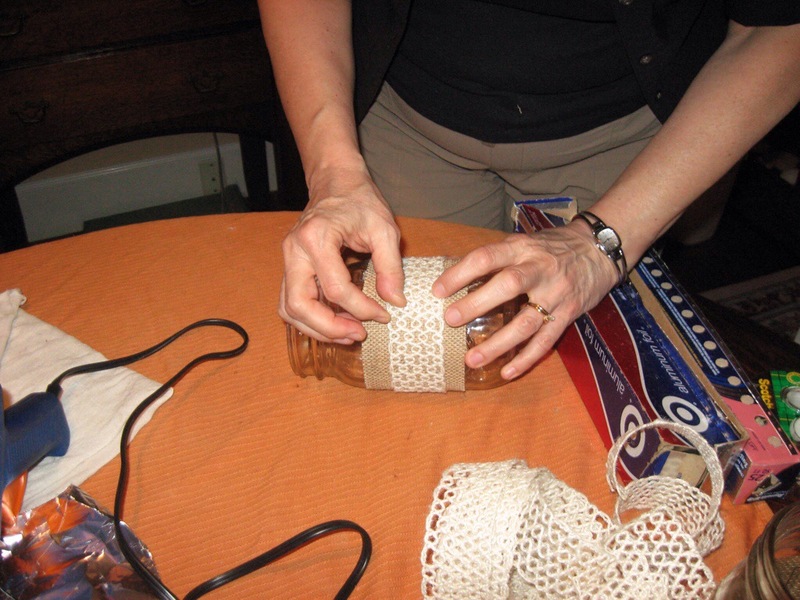 Cut your lace to the same length as the burlap. 4. 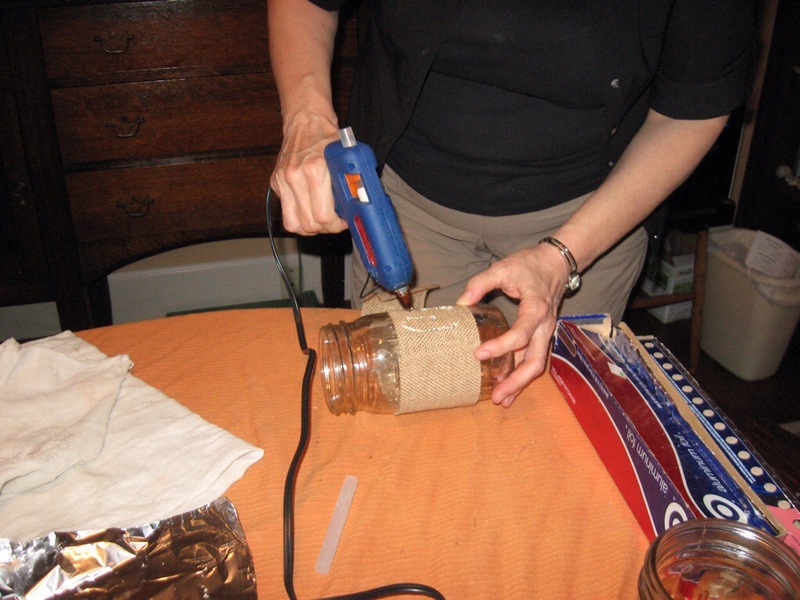 Using a hot glue gun, apply glue to about an inch of one end of the burlap. 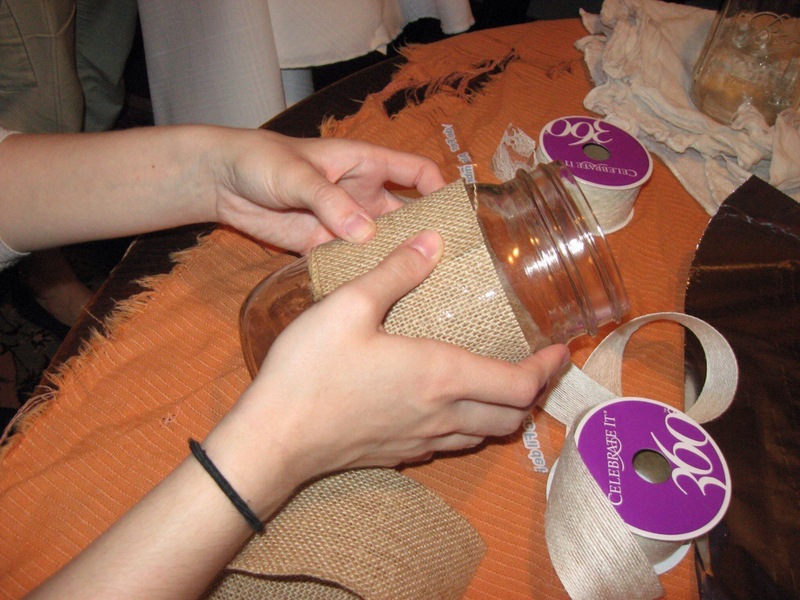 Place on top of the jar and overlap with the other end, creating a circle of fabric around the jar. 5. 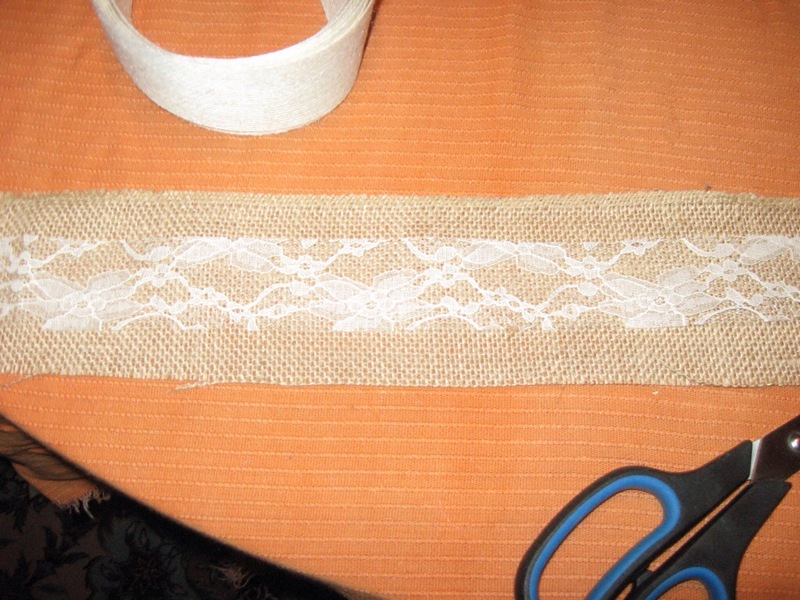 Repeat step 4 with the lace. 6. 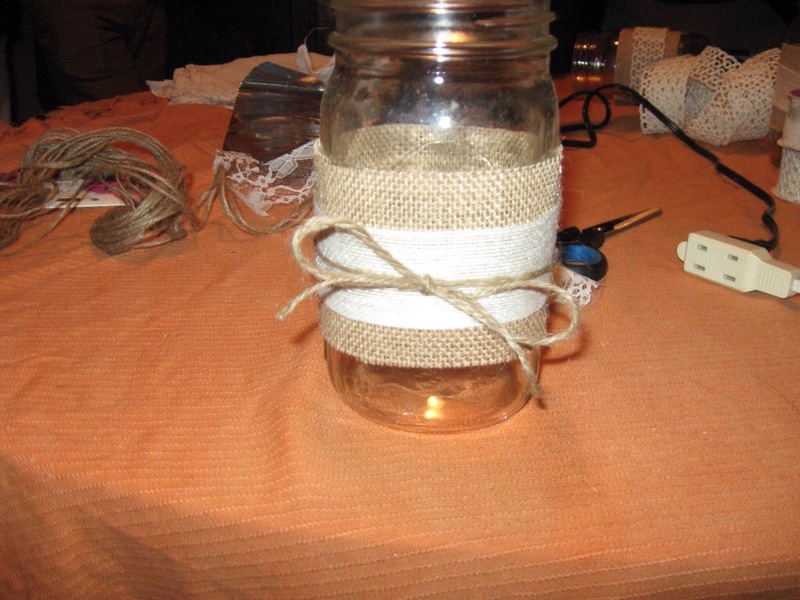 Use the hemp to tie a bow around the mason jar, centering it in the middle of the lace. Add a dot of glue to secure. …and you’re done! These super-simple center pieces took only an hour or two to make, and the materials cost about $100. We got our flowers from Trader Joe’s – I called ahead to make sure they would have enough! Flowers cost about $150, and drinks were around $150 as well. So, we managed to put together a very nice celebration for under $2,000! Wow, apparently when I said I wouldn’t be blogging as much I really meant it! Apologies yet again…life has taken a turn for the crazy/exciting/whaaaaa…??! The short version is that my hubby just landed a super awesome tech job in Silicon Valley, so we will be moving to the San Francisco Bay Area in less than a month! SO CRAZY. Needless to say, I have quite a mixture of emotions about this…I am pretty bummed about having to leave Boston Ballet and am more than a little worried that I won’t be able to find a comparably cool gig out west. But, I’m also excited – no more cold weather!! Yippee! And the time and freedom to do freelancing again, which is something I’d been wanting to explore/revisit. So anyhow, that’s that. But for now, I still have to finish my anniversary party blogging! Which feels like it was a century ago, although in reality it was just three weeks ago. TIME IS CRAZY. Anyhow, there have been so many awesome sewalongs and contests this summer that I’ve missed out on because of all the craziness, but one thing I really didn’t want to sit out on was Andi and Lauren’s Outfit Along. The idea of designing a sewn and a knit garment to go together is total genius, especially since I keep finding myself knitting things that don’t go with my wardrobe. It just so happened that the OAL started right as I was beginning work on The Dress. 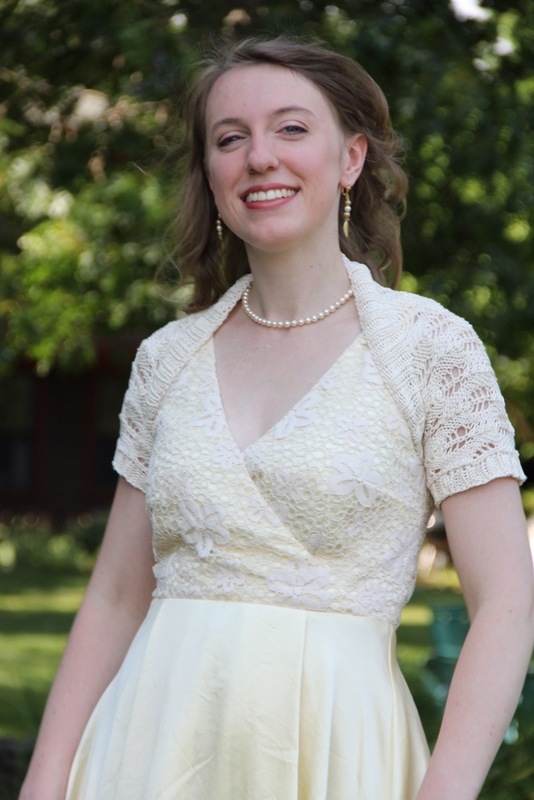 I actually didn’t think about knitting a garment to go with it until the dress was finished, but I realized afterwards that I wanted a little lacy bolero to go with it, and that knitting was the perfect solution! I found this adorable free pattern on Ravelry, which looked pretty quick and easy (I had a week left at that point! ), and also FREE! I thought the leaf pattern in the bolero would work nicely with the floral pattern on the dress lace. I knew I wanted a cotton yarn, since it’s summer and I didn’t want anything too warm, and was hoping to find something with a little sheen to it as well. I ended up finding the perfect yarn at my local yarn shop – a lovely mercerized cotton with just a touch of shine. The knitting was super fast – just a few days! – and I couldn’t be happier with the finished outfit. Ravelry notes are here, in case anyone is curious. Thank you all so much for the lovely responses on my last post – so sorry I’ve been such a lazy blogger and haven’t replied yet! I always appreciate your comments, and your support and encouragement means so much! And lastly, do you have any advice on sewing/music/other cool stuff to do in the Bay Area??? 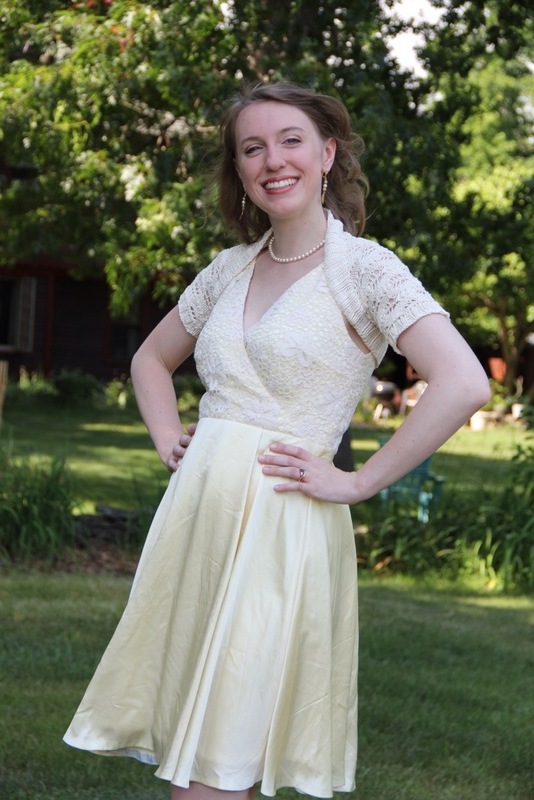 As promised, here is my post on The Dress that was worn to my Anniversary Party last week. 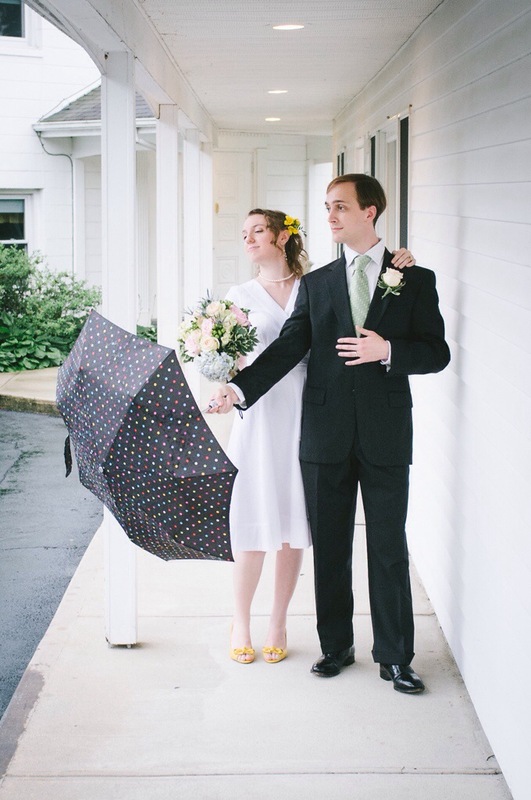 When my husband and I got married “on the fly” last year, my biggest regret was that I didn’t have time to make my dress. I had always dreamed of sewing my wedding dress, just like my mom had, but we since we put the wedding together in about two weeks and I wasn’t sewing much back then, there was no way it could happen in time. However, I had several months to plan our anniversary party, so I got a second chance! The fabric I used was a gorgeous buttercream silk charmeuse from my mom’s stash. I had had my eye on that fabric for over a decade – it had been used to create a costume for one of the Shakespeare productions I took part in way back before high school, and I had always dreamed of making something elegant out of it for myself. Luckily, there were still several yards of the fabric left – plenty for a tea-length gown! 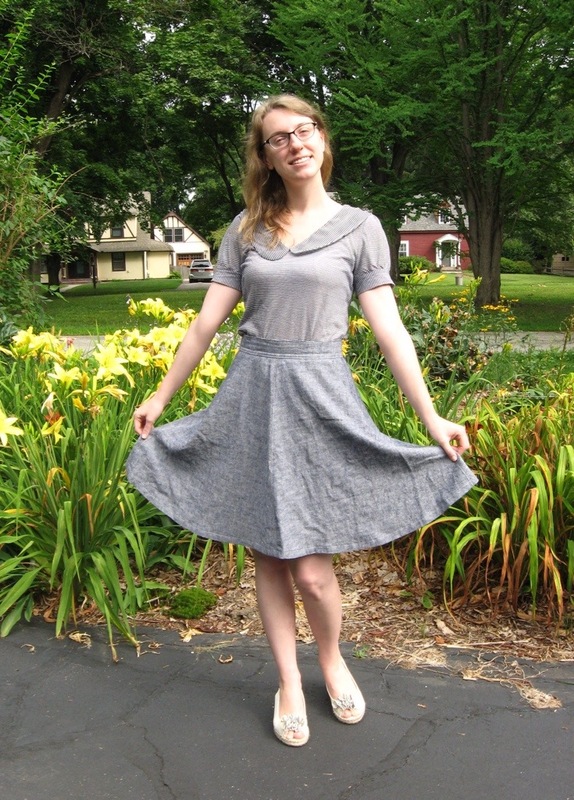 The pattern I chose was, of course, By Hand London’s Flora dress. I had originally thought of doing a floor-length Anna dress with the knee-high split, but I was having trouble visualizing it in the fabric. But as soon as I made my first Flora, I knew this was it! After much research, I finally found the courage to prewash and cut my silk. I cut my silk through a sandwich of tissue paper, using this great tutorial from Grainline as a guide. In retrospect, a heavier paper would’ve been better, but all I had on hand was my pattern tracing tissue. Next time, I will definitely invest in some craft paper. Nonetheless, I’m so glad I took that step – the silk didn’t shift around nearly as much, and I also didn’t have to worry about pins putting runs in my beautiful fabric! 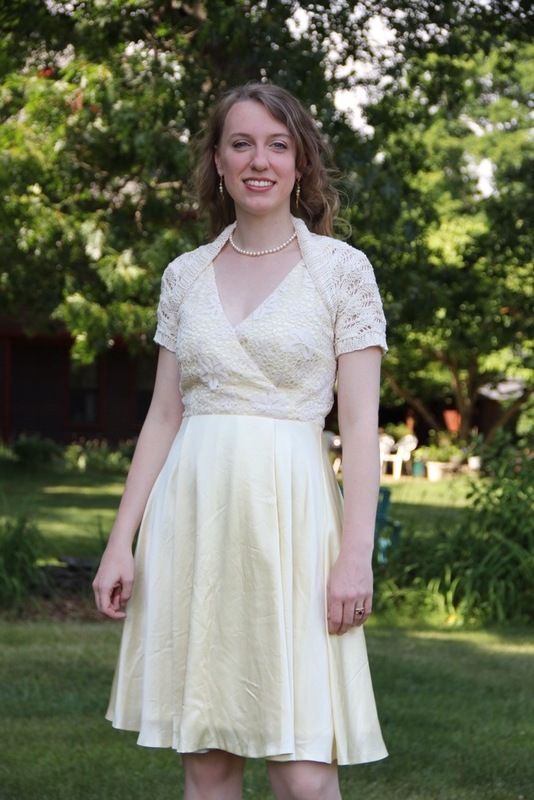 The lace on the bodice is a lovely cotton piece from Casual Elegance Fabrics. It was an amazing deal – $10/yard, and I only needed one! 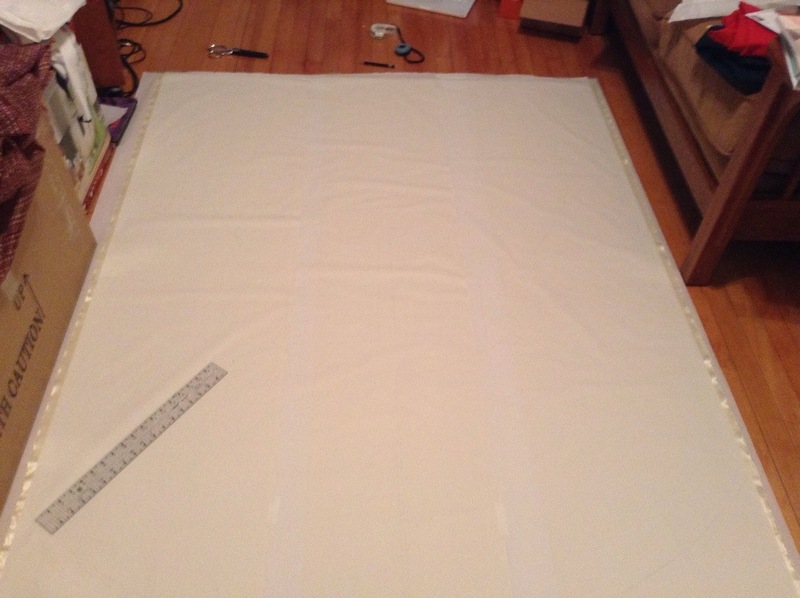 In fact, I paid more for my lining fabric (a dreamy cotton voile from Grey’s ) than I did for the dress fabric! 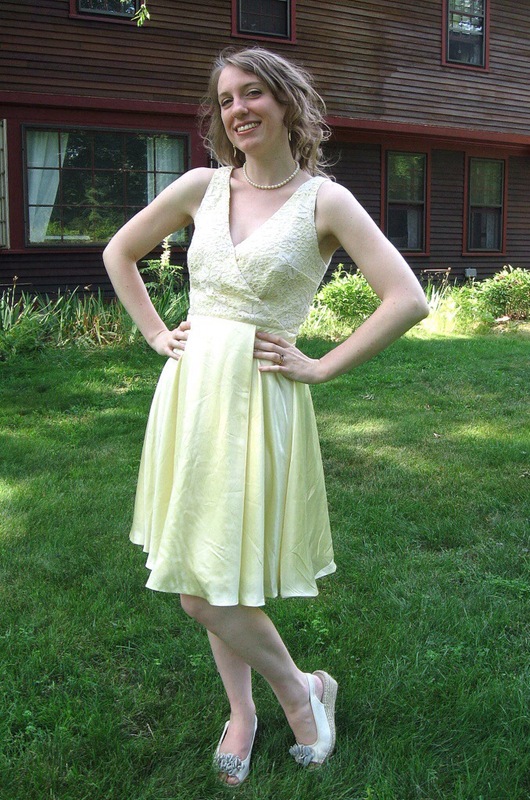 As a side note, this dress is one example of when sewing is cheaper than RTW – the dress cost me about $40 for all the materials. Compare that with the thousands of dollars people typically spend on their wedding dress – not bad! 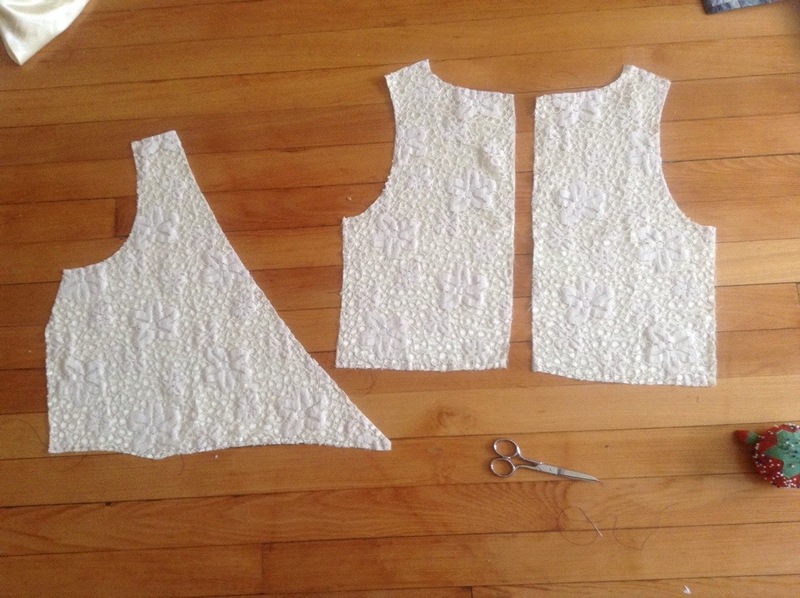 The construction was fairly time-consuming – since I was underlining the lace with the silk charmeuse, I had to hand-baste all the bodice pieces together. I also discovered that I had to hand-baste the darts, since I was having trouble catching the lace in the tip of the dart. There’s a kind of zen to taking the time and care for these extra steps, and I actually really enjoyed the process. I knew I was creating an heirloom, so I didn’t mind the extra effort. In addition to the hand-basting, I used French seams for the skirt seams and seam tape to bind all other exposed seams and sew the hem. 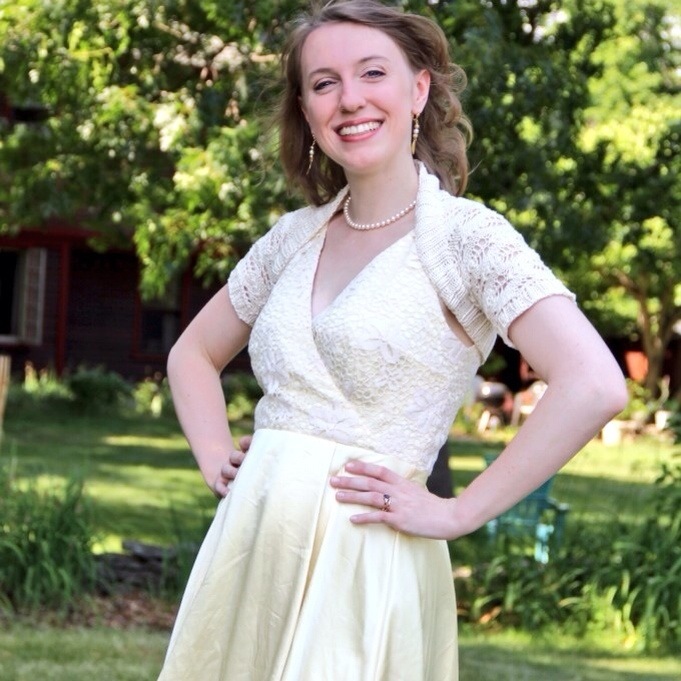 I’m so thrilled with how it turned out – this was exactly the wedding dress I’d always wanted! Not too much fuss, but elegant and very much my style. In the spirit of full disclosure, I’ll be upfront with you right off the bat: this will be a long, wordy, and reflective post, but there will be fun pictures at the end so you should keep reading :P.
That being said, it’s anniversary season! 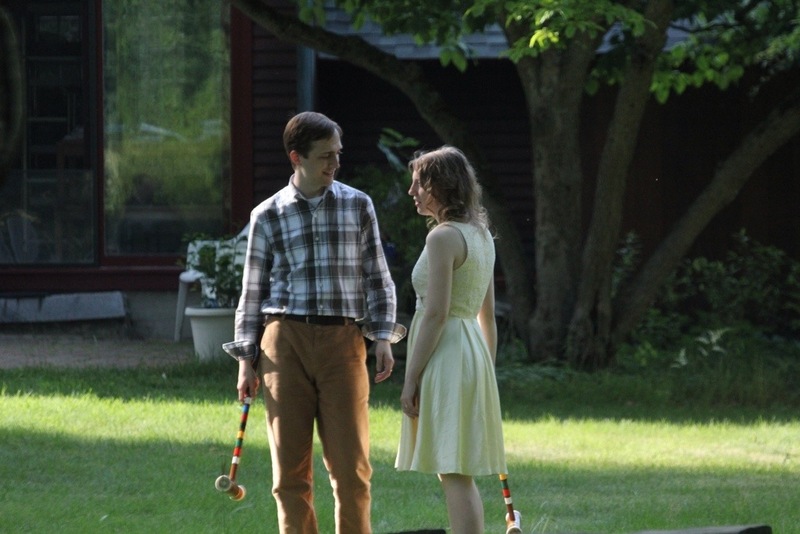 This year I have several special first anniversaries of sorts – the anniversary of my move to Boston, of my job with the Boston Ballet School, and, most importantly, of my marriage. It’s hard to believe I’ve been in Boston for a year – in a way, it feels more like 10, and yet it also feels like it was just yesterday that I lived in Princeton. City life has been a big adjustment for me – I tend to like a quieter lifestyle, so the boisterousness of a bustling city has a tendency to take its toll on me. I think I’m finally starting to get the hang of it, though – as long as the next winter isn’t as bad as the last one! The ballet school just began its summer intensive program this week, and it was this same time last year that I jumped on board with the music department team. Looking back, I now realize to what extent I truly had no idea what I was getting into! The summer program was a real “baptism by fire” – I was immediately thrown into playing for advanced-level classes, and it was sink or swim! My boss and colleagues were always supportive, and were happy to let me observe their playing or ask questions. Nonetheless, I remember many days last summer when I went home to my husband crying because I honestly thought I wasn’t qualified for the job. This job has been by far the most challenging professional pursuit of my life, but it has also taught me so much about what it means to be a musician. During the entirety of my musical education, I kept waiting for a professor or private teacher to tell me that I was truly talented – that I was “allowed” to be a skilled and intelligent musician. I felt that I couldn’t consider myself a “real” musician until someone with authority gave me the go-ahead. However, this job literally forced me to realize that you never need permission to be talented. After many months of feeling like the world’s worst ballet pianist, I took a good, hard look at all of the brilliantly talented dancers and musicians around me and noticed something rather astonishing – they didn’t need anyone’s permission to excel. They gave themselves that permission. And now that I am learning to give that permission to myself, it is transforming my music making. For the first time, I feel real confidence in my abilities. Not an overblown, egotistical attitude, but just the quiet strength of knowing that, while I can always learn more, I do have some idea of what I’m doing. 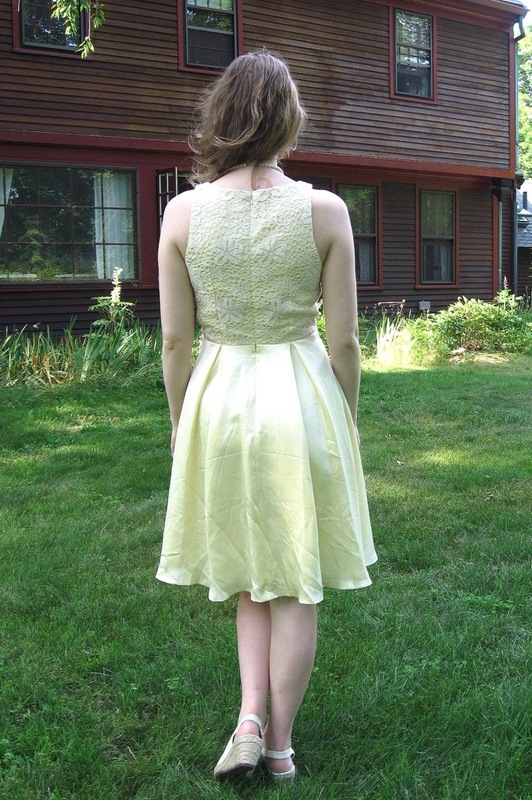 And of course, during this first year in Boston, sewing reentered my life! One thing that has always frustrated me about music is how ephemeral it is – all of your hard work practicing lasts for only minutes in a performance, and then it’s gone forever. The ability to produce concrete physical creations with my hands acts as the perfect antidote to that transience, and has helped me redefine who I am as an artist. Ever since graduate school, I’ve been trying to figure out what my “main identity” as a musician is – am I a singer? Pianist? Composer? Bringing sewing back into the mix reminded me that I am an artist – I’m all of those at once, as well as a seamstress and designer. I don’t have to choose one identity; I am happiest when I have them all! Whew, that was a lot of reflection! Now for the fun part – the wedding anniversary! 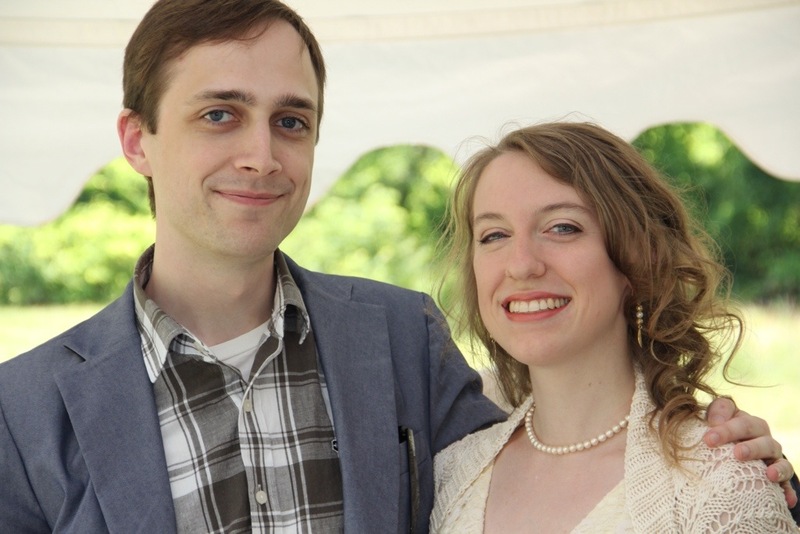 My husband and I decided to get married “on the fly” last June, and we had such little notice that there was no time to put together a big celebration. So, this year for our first anniversary, we threw a big party for family and friends! I’ll be writing several posts about the details – tutorials for the decorations as well as in-depth info on THE dress – but for now, here’s are some fun pics to reward you for reading such a long post!